Born about 304; died 11 December, 384. His father, Antonius, was probably a Spaniards; the name of his mother, Laurentia, was not known until quite recently. Damasus seems to have been born at Rome; it is certain that he grew up there in the service of the church of the martyr St. Laurence. He was elected pope in October, 366, by a large majority, but a number of over-zealous adherents of the deceased Liberius rejected him, chose the deacon Ursinus (or Ursicinus), had the latter irregularly consecrated, and resorted to much violence and bloodshed in order to seat him in the Chair of Peter. Many details of this scandalous conflict are related in the highly prejudiced "Libellus Precum" (P.L., XIII, 83-107), a petition to the civil authority on the part of Faustinus and Marcellinus, two anti-Damasan presbyters (cf. also Ammianus Marcellinus, Rer. Gest., XXVII, c. iii). Valentinian recognized Damasus and banished (367) Ursinus to Cologne, whence he was later allowed to return to Milan, but was forbidden to come to Rome or its vicinity. The party of the antipope (later at Milan an adherent of the Arians and to the end a contentious pretender) did not cease to persecute Damasus. An accusation of adultery was laid against him (378) in the imperial court, but he was exonerated by Emperor Gratian himself (Mansi, Coll. Conc., III, 628) and soon after by a Roman synod of forty-four bishops (Liber Pontificalis, ed. Duchesne, s.v. ; Mansi, op. cit., III, 419) which also excommunicated his accusers. Damasus defended with vigour the Catholic Faith in a time of dire and varied perils. In two Roman synods (368 and 369) he condemned Apollinarianism and Macedonianism; he also sent his legates to the Council of Constantinople (381), convoked against the aforesaid heresies. In the Roman synod of 369 (or 370) Auxentius, the Arian Bishop of Milan, was excommunicated; he held the see, however, until his death, in 374, made way for St. Ambrose. The heretic Priscillian, condemned by the Council of Saragossa (380) appealed to Damasus, but in vain. It was Damasus who induced Saint Jerome to undertake his famous revision of the earlier Latin versions of the Bible (see VULGATE). St. Jerome was also his confidential secretary for some time (Ep. cxxiii, n. 10). An important canon of the New Testament was proclaimed by him in the Roman synod of 374. The Eastern Church, in the person of St. Basil of Cæsarea, besought earnestly the aid and encouragement of Damasus against triumphant Arianism; the pope, however, cherished some degree of suspicion against the great Cappadocian Doctor. In the matter of the Meletian Schism at Antioch, Damasus, with Athanasius and Peter of Alexandria, sympathized with the party of Paulinus as more sincerely representative of Nicene orthodoxy; on the death of Meletius he sought to secure the succession for Paulinus and to exclude Flavian (Socrates, Church History V.15). He sustained the appeal of the Christian senators to Emperor Gratian for the removal of the altar of Victory from the Senate House (Ambrose, Ep. xvii, n. 10), and lived to welcome the famous edict of Theodosius I, "De fide Catholica" (27 Feb., 380), which proclaimed as the religion of the Roman State that doctrine which St. Peter had preached to the Romans and of which Damasus was supreme head (Cod. Theod., XVI, 1, 2). When, in 379, Illyricum was detached from the Western Empire, Damasus hastened to safeguard the authority of the Roman Church by the appointment of a vicar Apostolic in the person of Ascholius, Bishop of Thessalonica; this was the origin of the important papal vicariate long attached to that see. The primacy of the Apostolic See, variously favoured in the time of Damasus by imperial acts and edicts, was strenuously maintained by this pope; among his notable utterances on this subject is the assertion (Mansi, Coll. Conc., VIII, 158) that the ecclesiastical supremacy of the Roman Church was based, not on the decrees of councils, but on the very words of Jesus Christ (Matthew 16:18). The increased prestige of the early papal decretals, habitually attributed to the reign of Siricius (384-99), not improbably belongs to the reign of Damasus ("Canones Romanorum ad Gallos"; Babut, "La plus ancienne décrétale", Paris, 1904). This development of the papal office, especially in the West, brought with it a great increase of external grandeur. 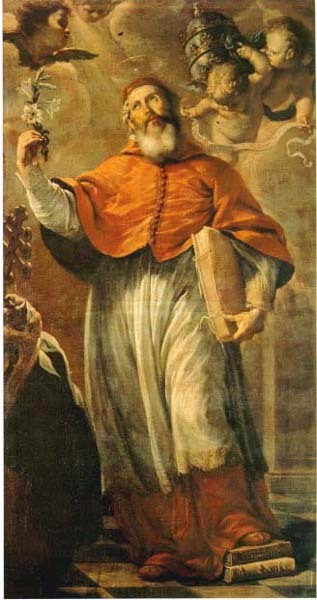 This secular splendour, however, affected disadvantageously many members of the Roman clergy, whose worldly aims and life, bitterly reproved by St. Jerome, provoked (29 July, 370) and edict of Emperor Valentinian addressed to the pope, forbidding ecclesiastics and monks (later also bishops and nuns) to pursue widows and orphans in the hope of obtaining from them gifts and legacies. The pope caused the law to be observed strictly. Damasus restored his own church (now San Lorenzo in Damaso) and provided for the proper housing of the archives of the Roman Church (see VATICAN ARCHIVES). He built in the basilica of St. Sebastian on the Appian Way the (yet visible) marble monument known as the "Platonia" (Platona, marble pavement) in honour of the temporary transfer to that place (258) of the bodies of Sts. Peter and Paul, and decorated it with an important historical inscription (see Northcote and Brownlow, Roma Sotterranea). He also built on the Via Ardeatina, between the cemeteries of Callistus and Domitilla, a basilicula, or small church, the ruins of which were discovered in 1902 and 1903, and in which, according to the "Liber Pontificalis", the pope was buried with his mother and sister. On this occasion the discoverer, Monsignor Wilpert, found also the epitaph of the pope's mother, from which it was learned not only that her name was Laurentia, but also that she had lived the sixty years of her widowhood in the special service of God, and died in her eighty-ninth year, having seen the fourth generation of her descendants. Damasus built at the Vatican a baptistery in honour of St. Peter and set up therein one of his artistic inscriptions (Carmen xxxvi), still preserved in the Vatican crypts. This subterranean region he drained in order that the bodies buried there (juxta sepulcrum beati Petri) might not be affected by stagnant or overflowing water. His extraordinary devotion to the Roman martyrs is now well known, owing particularly to the labours of Giovanni Battista De Rossi. For a good account of his architectural restoration of the catacombs and the unique artistic characters (Damasan Letters) in which his friend Furius Dionysius Filocalus executed the epitaphs composed by Damasus, see Northcote and Brownlow, "Roma Sotterranea" (2nd ed., London, 1878-79). The dogmatic content of the Damasan epitaphs (tituli) is important (Northcote, Epitaphs of the Catacombs, London, 1878). He composed also a number of brief epigrammata on various martyrs and saints and some hymns, or Carmina, likewise brief. St. Jerome says (Ep. xxii, 22) that Damasus wrote on virginity, both in prose and in verse, but no such work has been preserved. For the few letters of Damasus (some of them spurious) that have survived, see P.L., XIII, 347-76, and Jaffé, "Reg. Rom. Pontif." (Leipzig, 1885), nn. 232-254.